Founded in 1917, E.W. 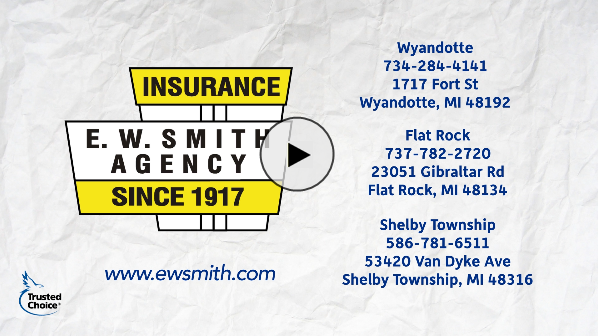 Smith Insurance Agency has three locations. Our offices in Wyandotte, Flat Rock and Shelby Township offer a personal approach to insurance where every customer has a dedicated agent. Specializing in Personal, Business and Life Insurance we help each customer find the optimal coverage while reducing costs. E.W. Smith is proud to represent some of the largest and most trusted insurance companies including Auto-Owners, Citizens, AAA, Frankenmuth, Progressive, The Hartford, and Nationwide, among others. We compare these highly rated companies in order to present our customers with a comprehensive insurance plan at the most competitive price. We have partnered with our neighbors andlocal business owners for 100 years to protect not only their families but also our community.